April 4 marks the 50th anniversary of the day Martin Luther King, Jr. was assassinated. Just after 6 p.m. on April 4, 1968, King was fatally shot while standing on the balcony outside his second-story room at the Lorraine Motel in Memphis, Tennessee. 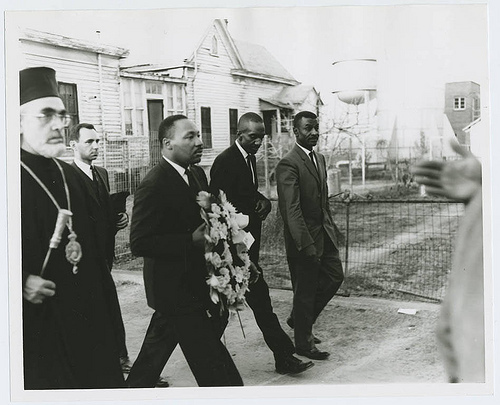 American history rightly honors King as one of its most celebrated civil rights leaders. Growing up, I remember learning about his famous “I Have A Dream” speech. In school, my teachers always highlighted him as a peaceful, non-violent protester against segregation, and a preacher who promoted messages of love and justice for all. He was all those things. But that’s only one part of King’s legacy. King was actually very radical about his vision of change for America. He didn’t just criticize segregation — he recognized the need for deep, structural changes to our entire economic and political system. He was right. Nearly 51 years after that speech, we’re still heading in that direction. A recent report from the Institute for Policy Studies found that just three people — Jeff Bezos, Bill Gates, and Warren Buffet — own more wealth than the bottom half of the country combined. “The Forbes 400 list altogether own $2.68 trillion in wealth, more than the GDP of Britain, the world’s fifth richest country,” the report notes. On the other end of the spectrum, one in five Americans have zero or negative wealth. The proportion grows larger when we break it down by race, rising to 30 percent of black families and 27 percent of Latino families. As much as we cite the vision that MLK laid out for America, decades later we’ve not moved in the right direction. Within the past year alone, we’ve seen GOP tax cuts siphon wealth from middle and working class Americans to the ultra-wealthy and big corporations. And we’ve seen a proposed federal budget that increases military spending to a historic 61 percent of discretionary spending in 2019. Housing and community programs would receive a 35 percent cut, according to the National Priorities Project. It’s all there: racism, materialism, and militarism.